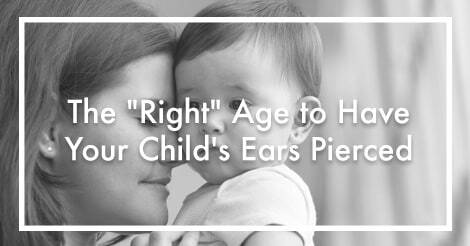 What is the right age for a child to have their ears pierced? The answer is that there is no correct answer to this question. The truth is, this is a highly personal decision that can only be answered through your own judgement. That being said, it is suggested to do some research regarding the pros and cons of piercing at any age. To help you get started, here are some factors to consider at three of the most common times a child is pierced. Before you decide to pierce your baby’s ears, we suggest that you speak with your pediatrician first. As of November 2015, the American Academy of Pediatrics (AAP) notes that as long as basic care is applied to the piercing, the process carries “little risk, no matter what the age of the child”. In many countries, (Spain, for example) it is customary for children to have their ears pierced at a very young age. We strongly recommend waiting until your child has had their first DPT vaccination (typically administered at 8 weeks of age) to allow for optimal immunity against infections. For a young child, the experience of getting their ears pierced can be an extremely special moment. Although at this age, your child tends to be more curious and thus raises some factors to contemplate. Is my child going to understand that they shouldn’t play or touch their new piercing while it’s healing? Will my child try to remove the piercing before it’s healed? Can I trust my child not to try to remove the earring without help? Remember, your decision ultimately comes down to your comfort and confidence that you are able and ready to care for your child’s piercing. Is your tween responsible for his or her hygiene and self-care? Can your tween be trusted to follow their ear piercing aftercare? Does your tween understand the importance of keeping the new piercing clean and only touching their piercing or earrings with clean hands? Will your tween allow you to check the piercing daily to be sure that it’s healing properly? The AAP again recommends as a general guideline, postpone the piercing until your child is mature enough to take care of the pierced site themselves. These questions should help to determine whether or not your tween is ready to handle the aftercare process. You may also want to consider your tweens hobbies and activities. For example, if your tween enjoys sports, you may want to time the piercing for “off season” in order to prevent accidents. At any age the decision ultimately comes down to the parent. But whichever age you do decide to have your child pierced, you can be assured that Inverness will offer a safe and gentle ear piercing experience. Inverness offers a wide assortment of piercing earring styles, aftercare instructions, and information to help you make the right decisions. Visit our website to learn more.